Arcade fire are an indie rock band coming out of Montreal, Quebec, Canada. They’re fronted by husband and wife duo Win Butler and Regine Chassagne, and supported by bassist Myles Broscoe, guitar/drummer Dane Mills and multi-instrumentalist Brendan Reed. Their music is is a nostalgic journey of musical artistry, consisting of diverse layers and rapid change ups, often ending in climatic explosions of lyrics, sound, and emotion. They enlist a multitude of different instruments with few songs taking part without the influences of harps, French horn, double bass, xylophone, violin, cello, piano, keyboard and guitar. Regine’s subtle, angelic voice is perfectly counterbalanced by Win’s, sometimes melancholy, sometimes wailey, more traditional but no less captivating vocals. They talk of life, times past, and our future in an effort to inspire and effect change. Their propensity to interchange between French and English, even in the one song, gives their music an exotic feel, taking you somewhere of in the distance you’ve perhaps not been. Their musical prowess is undeniable and their onstage performances emphatic. Their first release Funeral, came in 2004 to widespread critical and commercial success with over half a million albums sold in the US and Canada alone. They followed this up with Neon Bible, the culmination of recordings from 2004-2007, from which they resurrected an old church and converted it into a recording studio. 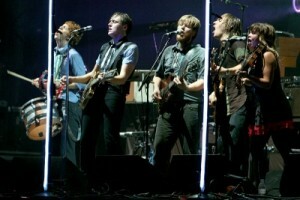 Neon Bible was similarly received with widespread success, earning them awards and acclaim evidenced by the album’s number 1 spot on Canadian, US and Irish album charts, and top 40 in the UK. In 2010 they released The Suburbs, which cemented their place as a multitalented band for everyone, that continues to push boundaries.